Enable Business Managers to place a cost per head on IT. Stop replacing hardware on site with ‘newer’ machines. Simply re-purpose old PCs. Dramatically reduce the headache of desktop support and repair. Immediately introduce a superb remote working solution. Unlike Terminal Server and other Desktop as a Service implementations. Our VHDs are totally autonomous. They are individual virtual machines with their own dedicated CPU, RAM and Storage. When replacing traditional PCs for our hosted desktops, the users won’t notice the difference. The desktops can even be personalised as normal. Connect to your VHD via a web portal, remote desktop connection or workspace connector from anywhere. Just like your local Windows domain. You can have any number of mapped network drives and shared storage provided by our cloud SANs. No data is stored on the operators physical computer, making the VHD solution is extremely attractive for companies concerned about the security of machines on site. All the usual Microsoft Active Directory, User and Group tools are available as normal. 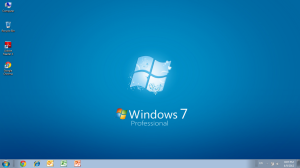 As long as an application is compatible with Windows 7, it will work on our hosted desktops. Each VHD is backed up every night and a copy retained for 7 days. We understand it’s tricky to embark on a project such as this without on-the-ground assistance. For an additional cost, RatwareUK will consult, plan and manage your hosted desktop migration ensuring no business downtime, a swift changeover and that the best solution is already provided on the first day of service. Virtual Hosted Desktops are billed on a subscription bases, monthly. The cost per unit is entirely dependent on how many you buy and if you need any SaaS add-ons such as Microsoft Office or Network Management and Support from RatwareUK. Please contact us to discuss you requirements further.